Tis' the season of pumpkin flavored everything, so I feel it's my duty to throw another recipe in the mix! Upon hearing "Why don't you ever make us any cookies!?" from my family, I decided to bake up these amazing white chocolate pumpkin cookies that I got from Taste of Home a few years back. And to answer their question- I don't make cookies because I sit and eat them all when I do, just like I did with this batch. In a large bowl, cream the butter and sugars until light and fluffy. Beat in the egg, vanilla and the pumpkin.Combine dry ingredients; gradually add to the creamed mixture and mix well. Stir in white chips. Drop by rounded teaspoonfuls 2 inches apart onto ungreased baking sheets. Bake at 350 degrees for 10 to 12 minutes, or until firm. Cool on wire racks. Top with frosting, if desired, when completely cooled. I am ALL OVER pumpkin flavored anything. These sound so GOOOOOOD! I like how you did the first picture! Really nice! Yummy! Those look and sound good! I want. It's perfect for a bake sale, or me to take to work. Oh my heavens--I know I would love these. I love pumpkin and white choclate is my favorite! I hear you when you say you do not make cookies very often. I have the same problem only I am single and end up eating them all!! Pumpkin is one of my favorite foods. These cookies look amazing. These look amazing! I really have an itch to make something pumpkin now! These look so amazing! I love everything pumpkin this time of year! Man! This looks so yummy! I think I might even make this on the Trick or Treat night :) Thank you for sharing the recipe.And TOTALLY pinning this pic here! These look perfect for fall! My kids are all about pumpkin flavored things when the weather gets colder. Oh man, the name is perfect. These ARE a dream. I love the pumpkin, white chocolate combo. Yum. I pretty much love all dessert, regardless of what season it is. These look especially yummy without the frosting. I'm fairly certain these cookies would be my favorite fall dessert! I have a friend who makes a delicious pumpkin whoopie pie. To die for. I am drooling right now. I can eat a whole batch of cookies by myself too! Go us! these sound and look delicious must try them. These sound good. Im with you about not baking cookies because I'll eat them all. These look amazing! I'll have to try them! You seriously just combined two of my favorite things! I cannot wait to make these!! I have a pumpkin that I pressure cooked and is ready to be made into SOMETHING. Perhaps this? Oh wow! Those look absolutely amazing! I love this time of the year with all the pumpkin goodies. These cookies look fantastic! These look amazing! I'm not very good at baking, but I may try them anyways! That looks super yummy, and I think I'd frost half and keep half plain. Great combination of ingredients! I'm not a huge pumpkin fan but even I can admit how awesome these look! Happy fall! Oh yum!!! These look so good! I couldn't have just one! These look and sound so yummy! Love the picture you shared. Those look deelish! Pumpkin is taking over and I kinda love it. OMGosh white chocolate mixed with pumpkin HAS to be awesome! I need to make these for my family! 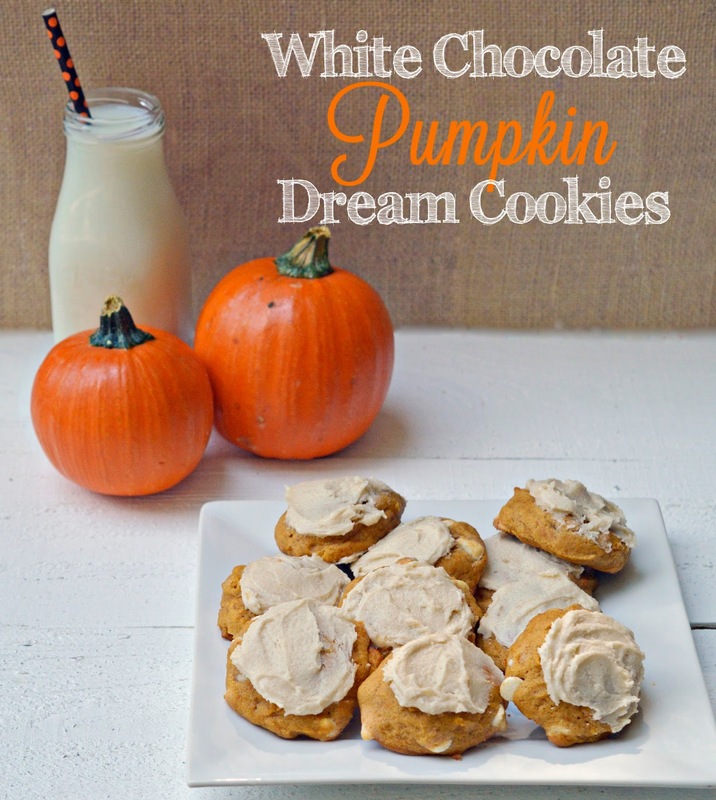 I love the flavor of pumpkin, and those cookies look absolutely delicious. What a gorgeous picture. Those look perfect for the end of September.